The UP 2100i Complete Component UpStage System™ was developed by CDT StageFront Audio engineers to create a superior live event listening experience in vehicles of all types. Road & Gear Magazine test review of CDT Audio UpStage Systems Quote: “The system imaged so well that I could imagine Dido standing on the dash board. The image of Dido was sharply focused and placed precisely under the rearview mirror. With the CDT 500-Series UpStage system hooked up - all images were high (about 6-8 inches above the dash) and out front in their correct locations, not down on the floormats. I heard bright, crisp, and clean sound from sharp images on a high, deep and wide soundstage. The sound seemed to be coming from the windshield. Image focus was realistic and convincing. Placement of of the musicians across the windshield stage was satisfying and compelling; the images were off the floor and above the dashboard, and we all agreed the CDT Audio UpStage™ system successfully raised the stage. This time, my ears, not my ankles, reaped the benefits”. I was also impressed by the clarity of the sound, even at high volume. I couldn’t believe how natural is sounded. In fact, I couldn’t get enough! With the CDT UpStage system, the images were hovering near the sunvisors.” Review the complete CDT 500_Series UpStage system test report in Road & Track roadgear In-Car Audio Video June-July-2005 issue. The impact of StageFront technology is immediately obvious - the voices and instruments seem to magically take shape in a seamless sound stage directly ahead above the dash. The result is to create a listening experience that is much more like the experience of attending the live event - the musicians and sound sources seem to be arrayed in front of you as if you were sitting at the live concert first row. Several psycho-acoustic effects need to be accomplished in order for this to work so well. High frequencies to the front: The sound image is moved more towards the front of the vehicle by gradually shifting the highest frequencies exclusively to the front of the vehicle, purposely directing (cross-firing) them inward and at an angle, using the windshield as a virtual ground plane. It is unlike any conventional speaker placement philosophy, but no other system creates the imaging effect of StageFront? technology. Less “highs” from the doors: All door speakers in the system are sheped and blended to keep the existing (typically two-way) door speakers radiating nearly flat power up to carefully lowered upper cutoff frequency. These higher frequencies are typically directional and can interfere with the angular dispersion pattern created by the StageFront? super Tweeters mounted ”cross-firing” up on the A-pillar or windshield above the dash. This careful shaping and blending process enables the dash mounted Tweeters to work transparently without creating a haze of localized reverberation in the front of the car. Unless the special StageFront? universally compatible blending filter modules are used, the added Tweeters would actually collapse the more natural and transparent frontal sound field that StageFront? creates. Our extensive listening tests support this conclusion. The effects of StageFront technology are NOT subtle. Reflective Cross-Firing: In our “UpStage” system series only the highest frequencies are handled by the cross-firing Tweeters that are mounted up on the dashor a-pillars. 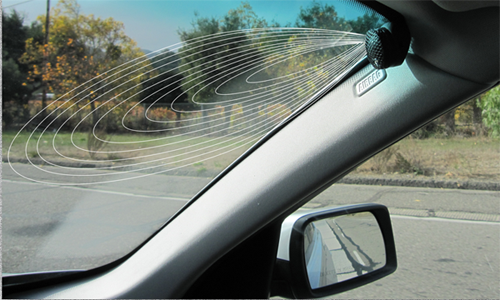 These Tweeters utilize the surface of the windshield to project a sound field of great clarity and transparency. Thel sound images can even appear to originate from beyond the windshield given good source material. On all source material, StageFront? technology ensures the apparent location of the sound source will not be associated with the position of the Tweeters whether virtual or actual. On all source material, StageFront Technology ensures the apparent location of the sound source will not be associated with the position of the Tweeters whether virtual or actual. This is a characteristic of any good speaker when properly set up. Extra spaciousness and clarity in the sound can be achieved. StageFront. CDT technology brings ideal “UpStage” imaging into any vehicle. The Upstage™ system is available as a system to transform your vehicle. 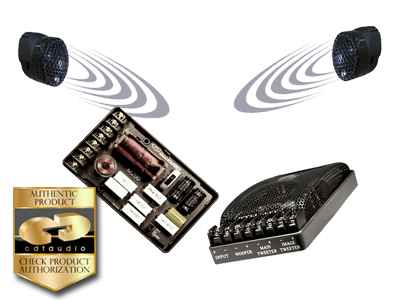 It includes a special set of frequency-control modules that can be combined with various speaker components that include Tweeters, crossover modules, and mounting hardware. The Upstage™ series add-on module in the system is a specific blending band-control module to set up the “cross-firing” windshield Tweeters. This blending module also shape and filters the signals going to the door speakers to maintain non-varying controlled dispersion. On-board jumpers set up various types of door speakers. Level-matching options are also provided to set up the Tweeters and perfect frequency tuning of the door speakers. A set of these Tweeters and various mounting options completes the primary front system. Nothing Ripped Out Or Thrown Out!